During my college years, I worked on the Westport House estate each summer, slowly getting to know all its incredible nooks and crannies. As time went on, I gained a deep understanding of the historic fabric of the estate, especially from the previous generations whom have worked the grounds, namely the late Lord Altmont and local man Tommy Heraty of Sandyhill. Tommy has worked at Westport House for more than 50 years. Back in 2014, at the launch of Jeremy Altamont’s book ‘A Life At Westport House: 50 Years-A-Going’, Tommy chatted to Westport’s prolific local videographer, Dr Oliver Whyte Senior. He told Dr Whyte that when he first came to work at the house, he started in the dairy, milking the cows (the estate owned around 70 bovine beasts back then). As a working farm, it the estate also produced hay, silage and corn for the livestock. The dairy cow’s calves would be reared for beef and sold on, and their milk (the main income source) would be brought to the creamery in Castlebar. The skimmed milk would be brought back, and that was used to feed the pigs. I feel so lucky to be involved in the restoration of these old gardens now. From my summers working on the grounds as a student, I had always remembered the terraced wall structure that framed the south side of the Italianate Terraces overlooking Westport House Lough. Over time, these terraces had become totally overgrown and somewhat lost, and their elegant walled tiers had all but disappeared. Action was desperately needed. 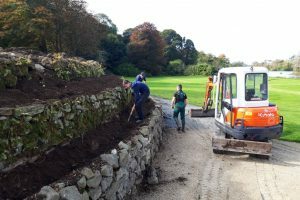 As the West Terrace restoration progressed towards the terraces last summer, myself and the grounds team investigated the overgrown embankment. To many of the team’s surprise and delight, we found the walls and the principle design of the triple-terraced structure to still be in reasonable condition. As a team, we formulated the most appropriate and sensitive course of action required to restore this lovely landscape feature. We firstly set about carefully removing the overgrown shrubs, which had strangled the terraces. In doing so, we pulled each shrub out of the ground with a mini digger. This allowed us to remove them without damaging any of the wall structure while also removed all roots from the terraced beds. 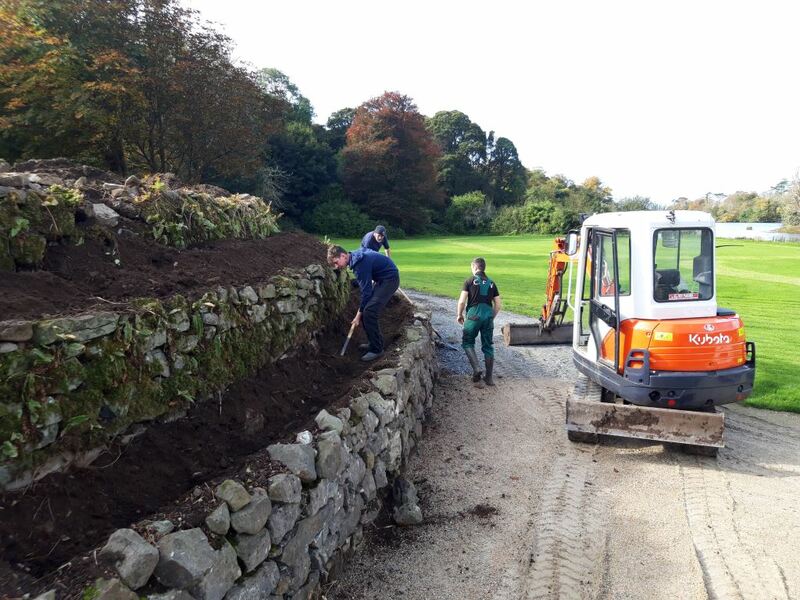 The grounds team then stated to removing all the nutrient-poor soil by hand, in order not to disturb the walls. This was a really labour-intensive, tough job – especially with the westerly wind howling in off Clew Bay! Still, everyone put their backs into it, and eventually all the effort paid off, and the beds were ready to be brought back to life. Horse manure was placed in each bed, and fresh soil mixed through. This rich new fertile soil will ensure that this year’s bloom will be spectacular. Strong foundations mean a strong house, as they say! The guys then set about planting the defining Yew (Taxus baccata) spheres randomly throughout the lower flower beds with a defining curved Taxus hedge on the top tier to frame the space. 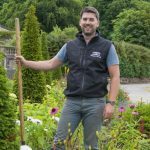 The beds were additionally planted with a mixture of herbaceous summer-flowering plants, which will explode with colour next year! Imagining the view from the house bridge over the west lawn to the cascading three-tiered terrace of vibrant colour is what kept us going. In addition, the team is also extending the sharply edged pathway along the ground level of the terraces. This will also visitors to walk along beside the tiers and get up-close and personal with the new plants and newly exposed walls. We hope to have this finished just in time for Christmas, so do drop in and to take a look and inspect our work. We’ve also been busy elsewhere on the estate. We’ve been planting a whopping 2,000 bulbs around the house this month in preparation for April and May of next year. This will ensure a vibrant show of alliums of all varieties and white and Deep Velvet Purple tulips. The roses have been cut back for winter, and all the beds will soon be manured for the winter months to make sure the flowers will be at their romantic, showy best next summer.